Spartan Health Sciences University held an annual multicultural festival called Taste of Spartan, on November 11, 2017. 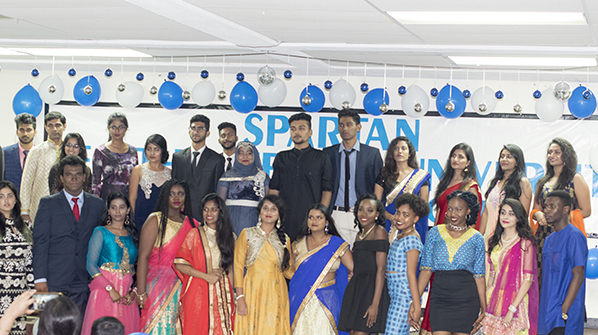 It was an event hosted to exemplify the cultures represented by all the students attending this institution. Approximately two hundred students in addition to faculty and family members attended the event. The evening started with an array of ethnic dishes from places such as Nigeria, Caribbean, India, Mexico, Italy, Egypt, and Cuba. Most of the food was prepared by students themselves to share their cultural background with everyone else. After dinner the night was filled with cultural performances by students which commenced with the national anthem of St. Lucia followed by a fashion show, dancing, and singing. It was a fun-filled event which everyone enjoyed and is looking forward to participating next year. This was an enthralling way to portray Spartan Health Sciences University diversity.